In the last year, we’ve seen Firefall PvP taken offline, Red 5 CEO Mark Kern dismissed by his board of directors, and a $23m funding boost to Firefall’s development. In fact, Firefall has been developed and redeveloped enough times now that you’d be forgiven for assuming it’d been released already somewhere along the line. But it deserves a bit of trumpeting. Full-time MMO, part time competitive shooter, Red 5 Studios’ debut can claim to be not quite like anything else in either genre. Perhaps you’ll consider playing it for nothing in just over two weeks’ time. 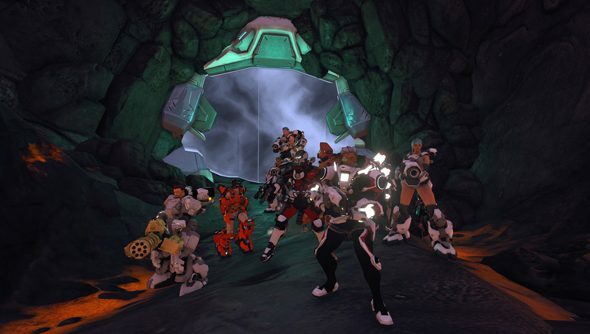 Firefall is free-to-play, so its new Steam page isn’t currently serving any monetary function. For now it’s good for confirmation that the game’s going to get all the good stuff associated with Valve’s platform – Steam Achievements, trading cards, controller support and the like. Red 5 will pull down their beta servers today for a 24-hour maintenance session – and from tomorrow, existing players will enjoy the release version of the game unbothered by newcomers until the end of the month. Digital starter packs have cost $29.99 and offer 30 days of early access, but are now presumably useless. Any would-be players who create new accounts before launch won’t be able to build a character. Have you been in the beta? Or are you, understandably, waiting for this free-to-play game to be free?